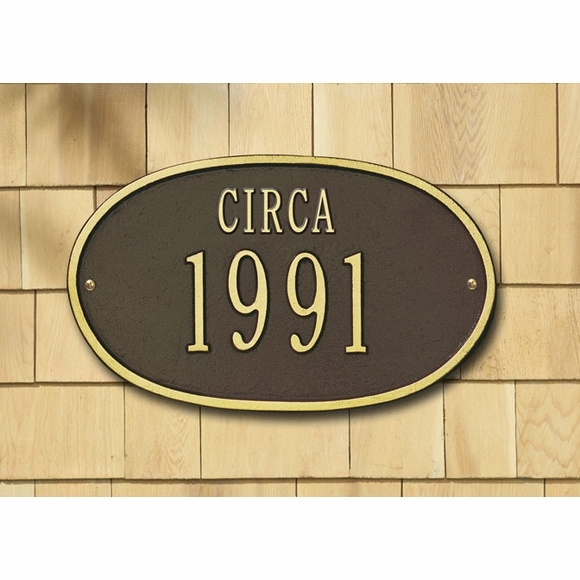 CIRCA Sign - - date plaque for historic home or historic site. Personalized with the year you specify. Made in USA. 12.5" x 7.5" oval sign shows the approximate or best-guess (circa) year that a historic home, building, institution, or site was founded, built, or established. Holds four 3" numbers under the word CIRCA. You can also purchase this historic marker with the word BUILT, FOUNDED, or ESTABLISHED (see Related Products). Your editor found the Circa 1840 plaque in the small image above mounted on the Salt Box Museum in New Providence, NJ. I purchased this as a gift for my daughter and son-in-law in their first home. They were very excited and pleased with the quality and couldn't wait to put it up. Made in the U.S.A. what can be better then that.